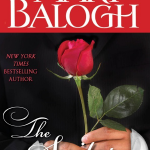 The Arrangement is Book 2 of the seven-part Survivors’ Club series, following after The Proposal. Six men and one woman, all variously wounded in or by the Napoleonic Wars, spent a number of years healing and recovering together at Penderris Hall in Cornwall, home of the Duke of Stanbrook. Now they spend a few weeks there each year, renewing their friendship and supporting one another in their efforts to live normal, productive lives. This is Vincent Hunt, Viscount Darleigh’s story. Although Vincent is only twenty-three years old, his female relatives are pressing him to marry. He is blind and he has recently inherited his title and vast estate. When they produce a suitable bride for him, he feels trapped and flees with his batman-turned-valet. He ends up six weeks later at his old home and almost gets trapped into another marriage he does not want. A young woman rescues him—and then faces destitution for her pains. When Vincent finds out about it, he has to decide what to do. But really, there is only one honorable course of action. Vincent has just arrived at Covington House, his old home in the village of Barton Coombs in Somerset. It is very early in the morning, and he hopes to stay there without anyone in the village knowing of his return. He does not want to be fussed over by people who knew him before he was blinded in battle. He wants peace and quiet and the chance to prepare himself for going back to his new home at Middlebury Park and explaining to his mother and sisters that he is quite capable of living his own life his own way. His hopes are doomed from the beginning, however. Vincent’s arrival had not gone unobserved. Covington House was the last building at one end of the main street through the village. To the far side of it was a low hill covered with trees. There was a young woman on that hill and among those trees. She wandered at all times of day about the countryside surrounding Barton Hall, where she lived with her aunt and uncle, Sir Clarence and Lady March, though it was not often she was out quite this early. But this morning she had woken when it was still dark and had been unable to get back to sleep. Her window was open, and a bird with a particularly strident call had obviously not noticed that dawn had not yet arrived. So, rather than shut her window and climb back into bed, she had dressed and come outside, chilly as the early morning air was, because there was something rare and lovely about watching the darkness lift away from another dawning day. And she had come here in particular because the trees housed dozens, perhaps hundreds, of birds, many of them with sweeter voices than the one that had awoken her, and they always sang most earnestly when they were heralding in a new day. She stood very still so as not to disturb them, her back against the sturdy trunk of a beech tree, her arms stretched out about it behind her to enjoy its rough texture through her thin gloves—so thin, in fact, that the left thumb and right forefinger had already sprung a leak. She drank in the beauty and peace of her surroundings and ignored the cold, which penetrated her almost threadbare cloak as if it was not even there, and set her fingers to tingling. She looked down upon Covington House, her favorite building in Barton Coombs. It was neither a mansion nor a cottage. It was not even a manor. But it was large and square and solid. It was also deserted and had been since before she came here to live two years ago. It was still owned by the Hunt family, about whom she had heard many stories, perhaps because Vincent Hunt, the only son, had unexpectedly inherited a title and fortune a few years ago. It was the stuff of fairytales, except that it had a sad component too. She liked to look at the house and imagine it as it might have been when the Hunts lived there—the absent-minded but much-loved schoolmaster, his busy wife and three pretty daughters, and his exuberant, athletic, mischievous son, who was always the best at whatever sport was being played and was always at the forefront of any mischief that was brewing and was always adored by old and young alike—except by the Marches, against whom his pranks were most often directed. She liked to think that if she had lived here then, she would have been friends with the girls and perhaps even with their brother. She liked to picture herself running in an out of Covington House without even knocking at the door, almost as if she belonged there. She liked to imagine that she would have attended the village school with all the other children, except Henrietta March, her cousin, who had been educated at home by a French governess. She was Sophia Fry, though her name was rarely used. She was known by her relatives, when she was known as anything at all, and perhaps by their servants too, as the mouse. She lived at Barton Hall on sufferance because there was nowhere else for her to go. Her father was dead, her mother had left them long ago and since died, her uncle, Sir Terrence Fry, had never had anything to do with either her father or her, and the elder of her paternal aunts, to whom she had been sent first after her father’s passing, had died two years ago. She felt sometimes that she inhabited a no man’s land between the family at Barton Hall and the servants, that she belonged with neither group and was noticed and cared about by neither. She consoled herself with the fact that her invisibility gave her some freedom at least. Henrietta was always hedged about with maids and chaperons and a vigilant mother and father, whose sole ambition for her was that she marry a titled gentleman, preferably a wealthy one, though that was not an essential qualification as Sir Clarence was himself a rich man. Henrietta shared her parents’ ambitions, with one notable exception. Sophia’s thoughts were interrupted by the sound of horses approaching from beyond the village, and it was soon obvious that they were drawing some sort of carriage. It was very early in the day for travel. It was a stagecoach, perhaps? She stepped around the trunk of the tree and half hid behind it, though it was unlikely she would be seen from below. Her cloak was gray, her cotton bonnet nondescript in both style and color, and it was still not full daylight. It was a private carriage, she saw—a very smart one. But before she could weave some story about it as it passed along the village street and out of sight, it slowed and turned onto the short driveway to Covington House. It stopped before the front doors. Ah. Her eyes widened. Could it be…? The coachman jumped down from his perch and opened the carriage door and set down the steps. A man descended almost immediately, a young man, tall and rather burly. He looked around and said something to the coachman—Sophia could hear the rumble of his voice but not what he said. And then they both turned to watch another man. He descended without assistance. He moved sure-footed and without hesitation. But it was instantly obvious to Sophia that his cane was not a mere fashion accessory but something he used to help him find his way. She sucked in a breath and hoped, foolishly, that it was inaudible to the three men standing some distance below her. He had come, then, as everyone had said he would. The blind Viscount Darleigh, once Vincent Hunt, had come home. Her aunt and uncle would be over the moon with gratification. For they had made up their minds that if and when he came, Henrietta would marry him. Henrietta, on the other hand, would not be gratified. For once in her life she was opposed to her parents’ dearest wish. She had declared more than once in Sophia’s hearing that she would rather die a spinster at the age of eighty than marry a blind man with a ruined face even if he was a viscount and even if he was even more wealthy than her papa. Viscount Darleigh—Sophia was convinced that the new arrival must be he—was clearly a young man. He was not particularly tall and he had a slight, graceful build. He carried himself well. He did not hunch over his cane or paw the air with his free hand. He was neatly, elegantly clad. Her lips parted as she gazed down at him. She wondered how much of the old Vincent Hunt was still present in the blind Viscount Darleigh. But he had descended from his carriage without assistance. That fact pleased her. She could not see his face. His tall hat hid it from her view. Poor gentleman. She wondered just how disfigured it was. He and the burly man stood on the driveway for a few minutes while the coachman went striding off to the back of the house and returned with what must be the key, for he bent to the lock of the front door, and within moments it swung open. Viscount Darleigh ascended the steps before the door, again unassisted, and disappeared inside with the larger man behind him. Sophia stood watching for another few minutes, but there was nothing more to see except the coachman taking the horse and carriage to the stables and coach house. She turned away and made her way back in the direction of Barton Hall. Standing still had thoroughly chilled her. She would not tell anyone he had arrived, she decided. No one ever spoke to her anyway or expected her to volunteer any information or opinion. Doubtless everyone would know soon enough, anyway. Unfortunately for Vincent and his hope for a quiet stay at Covington House, Sophia Fry was not the only person who observed his arrival. A farm laborer, on his way to milk the cows, had the distinct good fortune—of which he boasted to his colleagues for days to come—of witnessing the arrival of Viscount Darleigh’s carriage in Barton Coombs and its subsequent turn onto the short driveway to Covington House. He had stayed, at the expense of the waiting cows, to watch Vincent-Hunt-that-was descend after the steps had been set down by Martin Fisk, the blacksmith’s son. By seven o’clock in the morning he had told his wife, having dashed back home for that sole purpose, his baby son, who was profoundly uninterested in the momentous news, his fellow laborers, the blacksmith, the blacksmith’s wife, and Mr. Kerry, who had come in early to the smithy because one of his horses had cast a shoe late the evening before. By eight o’clock, the farm laborers—and the original farm laborer’s wife—had told everyone they knew, or at least those of that category who came within hailing distance; Mr. Kerry had told the butcher and the vicar and his aged mother; the blacksmith’s wife, ecstatic that her son was back home in the capacity of valet to Viscount Darleigh, Vincent-Hunt-that-was, had dashed off to the baker’s to replenish her supply of flour and had told the baker and his two assistants and three other early customers; and the blacksmith, also bursting with pride even though he spoke with head-shaking disparagement of his son, the valett, told his apprentice when that lad arrived late for work and for once did not have to recite a litany of excuses, and Sir Clarence March’s groom, and the vicar, who heard the news for the second time in a quarter of an hour but appeared equally ecstatic both times. By nine o’clock it would have been difficult to discover a single person within Barton Coombs or a three-mile radius surrounding it, who did not know that Viscount Darleigh, Vincent-Hunt-that-was, had arrived at Covington House when dawn had barely cracked its knuckles and had not left it since. Though if he had arrived that early, Miss Waddell observed to Mrs. Parsons, wife of the aptly-named vicar, when the two ladies encountered each other across the hedge separating their back gardens, he must have been traveling all night and was enjoying a well-deserved rest, poor gentleman. It would not be kind to call upon him too early. Perhaps Mrs. Parsons would inform the reception committee? Or should she? Actually, she would since she was in need of some exercise. Poor dear gentleman. The vicar rehearsed his speech of welcome and wondered if it was too formal. For, after all, Viscount Darleigh had once been just the sunny-natured, mischievous son of the village schoolmaster. He was, in addition to everything else, though, a war hero, who had made a great sacrifice for his country, even if not the ultimate one. And he did now have that very impressive title. Best to err on the side of formality, he decided, than risk appearing over-familiar. Mrs. Fisk baked the bread rolls and cakes she had been planning in her head for weeks. Her son, her beloved only child, was back home, not to mention Viscount Darleigh, that bright and happy boy who had used to run wild with Martin and drag him into all sorts of scrapes—not that Martin had taken much dragging. Poor boy. Poor gentleman. She sniffed and wiped away a tear with the back of her floury hand. At ten o’clock Miss Pamela Granger, aged eighteen, and her younger sister, Julia, sixteen, walked the length of the village street to call upon their bosom friend, Miss Pauline Hamilton, aged seventeen since last Thursday week, to discover what she planned to wear to the assembly, which would surely happen now that Lord Darleigh had come. Was Pauline as excited as they were? Squeals and hugs were as eloquent as any verbal answer might have been. And the three of them proceeded to put their heads together and draw out memories of Vincent-Hunt-that-was winning all the races at the annual village fête by a mile and bowling out every cricketer on the opposing team who had the courage and audacity to come up to bat against him and looking so very handsome with his always over-long fair curls and his blue, blue eyes and his lithe physique. And always smiling his lovely smile, even at them, though they had been just little girls at the time. He had always smiled at everyone. Ah, it was such a shame, they agreed, that… The trio of young ladies shed a few tears apiece. For Viscount Darleigh would never now win any race or bowl at any cricket game or look handsome—or perhaps even smile at anyone. He would not even be able to dance at the assembly. They could conceive of no worse fate than that. Vincent would have been horrified to know that, in fact, his arrival in Barton Coombs had been expected. Or, if that was too strong a word, then at least it had been looked for with eager hope and cautious anticipation. For Vincent had forgotten two overwhelmingly significant facts about his mother and his sisters. One was that they were all inveterate letter writers. The other was that they had all had numerous friends at Barton Coombs and had not simply relinquished those friends when they moved away. They might not be able to visit them daily, as they had been used to do, but they could and did write to them. His mother had not been reassured by the two notes that had arrived, scrawled in the inelegant hand of Martin Fisk. She had not sat back and waited for her son to come home. Rather she had done all in her power to discover where he was. Most of her guesses were quite wide of the mark. But one was that Vincent might retreat to Barton Coombs, where he had spent his boyhood and been happy, where he had so many friends and so many friendly acquaintances, where he would be comfortable and would be made much of. Indeed, the more she thought of it, the more convinced she became that if he was not already there, he would end up there sooner or later. So she wrote letters. She always wrote letters anyway. It came naturally to her. And Amy, Ellen, and Ursula wrote letters too, though they did not share their mother’s conviction that Vincent would go to Barton Coombs. It was more likely that he had gone back to Cornwall, where he always seemed to be so happy. Or perhaps to Scotland or the Lake District, where he could escape their matchmaking clutches. All three of Vincent’s sisters rather regretted the aggressive manner in which they had pressed Miss Dean upon him. She was a sweet and biddable girl, it was true, but it had been crystal clear that she was not as eager as she might have been to marry their dear, precious brother. Well-bred though she was, she had been unable quite to hide her relief when it was discovered that he had left Middlebury Park in the middle of the night and taken his valet and his carriage with him. Long before Vincent actually did arrive in Barton Coombs, then, there was scarcely a person there who did not know for a near certainty that he would come. The only question that had caused any real anxiety was when. Everyone, almost without exception, was enraptured as the news spread through the village and beyond that the wait was at an end. He was here.